Last year's Dog Days of Summer Contest was so popular that we thought we'd try it again. If you have a photogenic boat dog, enter now! Last year's winner was a one-year-old golden retriever named Bruin; photo by Allyson Stone. Send one to three high resolution photos (camera photos preferred but cell phone shots might work) of your dog on a boat to [email protected] by June 25. Vertical photos preferred, with room for our header and footer. We love images of happy boaters, so don't hesitate to send photo with a dog and a person in it. If that person is a child, make sure he or she is wearing a lifejacket (properly) or we won't consider it for the cover. The winning image will appear on the cover of the August 2018 issue. 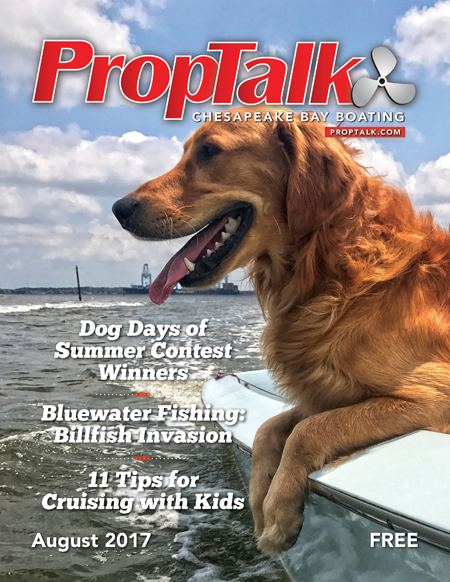 So, get out there on the water and take some pretty pictures of your boat dog striking a pose. Best of luck! For more Boat Dog resources, as well as an awesome compilation of boat dog photos from year's past, click to our Boat Dog page.